With over 13,000 undergraduate students attending the University of Rhode Island each year, it is no wonder housing arrangements on-campus have had their fair share of difficult times. The Department of Housing and Residential Life (HRL) has transformed their housing approach in order to offer students a guaranteed spot in residence halls while also providing resources to those unhappy in their dorms. Associate Director of HRL, Jeffrey Plouffe has made it a point throughout his 12 years at URI to improve living situations for students. From round the clock accessibility to himself and the department, there seems to be a miscommunication among the student body. What Plouffe believes assist the students in learning about URI’s residential life may not be as effective as they had intended. Freshmen and Barlow Hall resident, Shelby Blanchard has first-handedly experienced this lack of communication. Although she was aware of the potential triple-roommate living arrangements, she was not prepared for what occurred on her move-in day. When she arrived at her room, both her roommates had already designated their own living space, which include the bed set up, desk area and drawer space. 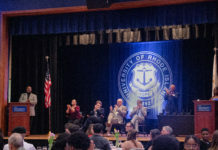 Although, Plouffe has made significant strides in providing prospective students as well as current students with the right information, it seems as though the student body has yet to really understand what on-campus housing at URI is really all about. In 2004, the Customer Service Center was added as a branch, allowing students and parents to contact the department directly with requests and/or concerns. They encourage anyone to take advantage of this resource when looking to resolve undesirable housing arrangements or even for basic day-to-day dorm room assistance. Whether or not the student body approves of the methods put in place, there is a method to this madness. In order for there to be enough room for the students who want to live on campus to have housing, some students must be placed into triples. There is also a financial perspective to Plouffe’s method. If there are not enough people living on campus, the prices for individual on-campus housing will increase. For students like Maddie Lavoie, a forced triple living arrangement was not an unforgiving experience. By allowing freshmen to choose their own roommates, students are given the opportunity to make their living arrangements as comfortable as possible. By choosing her roommates, Lavoie was capable of meeting them before the semester started allowing for friendships to develop even before they had gotten to school. Triples might be an incentive for some because of the $544 discount students receive at the end of each semester. Luckily for her, once second semester came around, one of her roommates had been accepted to live in her sorority house. A few weeks later, Lavoie and her other roommate were now living in a comfortable double. Plouffe mentioned that this happens in over 50 percent of cases from registration to the fall. While some students may see living with two other roommates as a miserable experience, Plouffe has developed a holistic perspective to this not so harmful situation. He believes that URI’s housing arrangements can offer students more than just a place to sleep at night. Future housing plans have been proposed in order to increase on-campus housing capacity at URI. Apartment buildings are in the works, which will offer upperclassmen more independence and a larger scale of housing arrangements to choose from. Plouffe advises students to put your best foot forward at being the best roommate you could possibly be.